Now that it is starting to heat up, you may be feeling it’s time to get ready for summer by cleaning up, clearing out, and tidying up. Here are several tips and tricks to help make the most of your summer season. To enjoy your patio or deck to the fullest, it is best to give it a thorough cleaning at the beginning of the season. Inspect your deck for any damage that might have occurred during the winter. Hammer any nails that are coming out, make repairs to loose or split boards. Next up, give your patio or deck a good cleaning. Start by sweeping away debris, leaves and twigs. 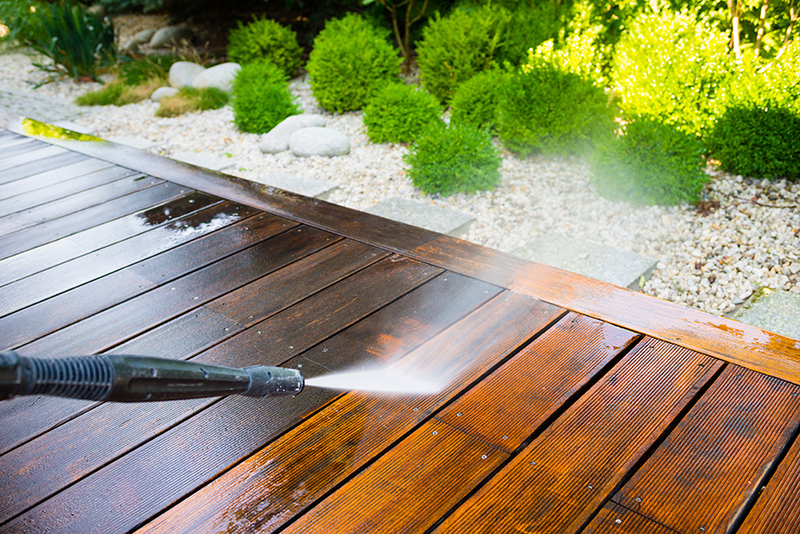 You may choose to scrub the surface with a mild, natural cleanser or a pressure washer could be used if you stain and seal your deck again after. If you have fungus or algae on your patio or deck, scrub it with hydrogen peroxide. Never use bleach (which was long recommended for cleaning decks) as the bleach will dissolve the resins in the wood that hold it together. Hydrogen peroxide also oxidizes fungus and algae like bleach does, but is not as harmful and damaging. It is also safer for the yard around the deck. After cleaning off the patio or deck, you will want to get the barbecue grill ready for cookouts. Use a non-scratch sponge or nylon brush to dry-scrub the grates, burners, and inner surfaces. You can use an emery cloth or a wire brush on uncoated steel or iron. Next wash the interior and exterior surfaces with dish soap and water. If there is a lot of built-up grease, use a homemade, natural degreaser to tackle the job. Spray the degreaser on and let it sit for an hour before scrubbing. Combine the ingredients in a new spray bottle, and shake vigorously. Summer is often the time we get around to cleaning out the garage. We all tend to collect a lot of clutter, so be prepared to sort through the contents to recycle, reuse, and organize. Use your preferred method for deciding what to keep. When you’re ready to tackle the dust and dirt in the garage, you’ll need gloves, a heavy-duty push broom, a respirator, and a shop vac. Your garage may contain harmful contaminants, so it is important to use a respirator in order to prevent breathing in fumes, dust, or other particulates. If you have oil stains on your concrete, you can use detergent for small stains or an eco-friendly microbial cleaner for larger stains. Once you have decluttered, swept, vacuumed, and degreased; it is time to think about organization. Installing shelving, pegboards, hooks, and overhead storage will make items easier to find and stop you from tripping over the rake or the kids bicycles. To effectively clean and kill mold, use undiluted distilled white vinegar. Vinegar kills 82% of mold species. Vinegar sprayed on mold-prone areas and left to dry in place will help prevent mold from returning. Many of us enjoy opening the windows in summer to get that fresh air. What we don’t enjoy is having our allergies enraged by pollen or all the dusting and cleaning we have to do after a long draught of fresh air. Now you can get window filters, which filter out pollen and dust. You can also find window filters with activated charcoal, which can filter out smoke and pollution, in addition to the dust and pollen. Window filters come in all different shapes and sizes, along with screen material you can use in your own window screens. Enjoy uncomplicated fresh air in your home this summer. As you are planning your summer cleaning and preparations, if you find you need help, contact us at Maid for Portland. We’re happy to help with any part or all of your cleaning project. If you have questions about the projects or cleaning we handle, or would like to get an estimate, contact us right away and we’ll be happy to help.